Yu Pengnian’s journey from poor street hawker to Hong Kong real-estate magnate was already a remarkable one. Then the 88-year-old did something even rarer that shocked many in increasingly materialistic China: He gave it all away. Saying he hoped to set an example for other wealthy Chinese, Mr. Yu called a press conference in April to announce he was donating his last 3.2 billion yuan (about $500-million) to a foundation he established five years earlier to aid his pet causes – student scholarships, reconstruction after the 2008 Sichuan earthquake, and paying for operations for those like him who suffer from cataracts. With that endowment, Mr. Yu became the first Chinese national to give more than $1-billion to charity, now having contributed almost $1.3-billion in cash and real estate to the Yu Pengnian Foundation. In a stunned China, the question came quickly: Wouldn’t his children be angry that he had given their inheritance away? 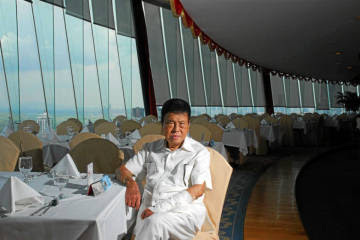 “They didn’t oppose this idea, at least not in public,” the eccentric Mr. Yu says, laughing, when asked the question again during an interview at his foundation’s office atop the 57-storey Penglin Hotel in the southern Chinese city of Shenzhen. To make sure that didn’t happen, he appointed HSBC as his foundation’s trustee and stipulated that none of its holdings could be inherited, sold or invested. It would be easy to characterize Mr. Yu as an oddball. His hair is dyed jet black and held up in a bouffant. He regularly wears white Mao suits and matching white shoes at which his Western-educated grandchildren quietly cringe. His desk, which sits in the middle of an office he shares with half a dozen of the foundation’s staff, is covered with such oddities as a bowl of plastic fruit, a money-counting machine, and a pair of duelling model fighter planes, one Chinese, one American. He displays little of his wealth – he lives in the Penglin Hotel and eats most of his meals in the buffet restaurant – but sits beneath a giant smiling portrait of himself. Another giant dinner plate emblazoned with a picture of Mr. Yu sits propped up on his desk, gazing directly at anyone who pulls up a chair across from him. As offbeat as he may be, it’s hard to question his generosity. Mr. Yu, who is ranked the 432nd richest person in mainland China, has topped the Hurun Report lists of the country’s top philanthropists four years running – and will certainly do so again this year – leading by example as the idea of large-scale giving has quietly taken hold among a growing number of China’s superwealthy. After his release, he finally caught a gust of good fortune when he was granted rare permission to travel to Hong Kong. He found a job as a cleaner at a large firm, and even though he spoke no English or Cantonese, slowly impressed his way up into a junior management position, saving everything he earned along the way. In the 1960s, Mr. Yu and some friends pooled their money together and bought their first property, the beginning of a new career that would see him make millions through shrewd purchases that he would sometimes later sell at 20 or more times the original price. As his holdings grew, he became notorious in Hong Kong as the “Love Hotel King” – a name he detests – because many of the properties he owned were rented by operators of hotels catering to hourly stays. He also won fame for buying the last home that kung-fu star Bruce Lee lived in before his death, a property Mr. Yu later donated back to the Hong Kong government as a museum. But in rural China, particularly his native Hunan province, Mr. Yu was developing a very different reputation. When he returned to his hometown of Lou De each year for the Spring Festival holiday, he handed out red envelopes stuffed with cash to the elderly and poor. Those trips taught him an early lesson about the perils of charitable giving. One year, he enlisted the help of local government officials to help him stuff each envelope with 400 yuan. He found out later that much of the cash had been pocketed by the corrupt bureaucrats, and to this day he insists that the money he donates go directly to the recipients without going through any other charities or government agencies. “In China, I do charity only with my own eyes and hands. I don’t trust others,” he says. Mr. Yu’s initial foray into wider-scale philanthropy came after he developed cataracts and had a successful operation to repair his eyes in 2000. When he researched the disease afterwards, he found that 400,000 Chinese developed cataracts every year, and many sufferers couldn’t afford the required surgery. He was deeply moved and decided to spend $10-million annually on mobile cataract clinics that drive to the most remote parts of China to perform surgeries paid for by Mr. Yu. His own oversized photograph – his eyes clear of cataracts – is on the side of the “Bright Eyes” vans, which have carried out more than 150,000 cataract operations around the country since 2003. Mr. Yu is proud to hear his name mentioned alongside such famous Western philanthropists as Bill Gates and George Soros – as well as Hong Kong’s Li Kashing, Asia's most famous philanthropist who has given away $1.4-billion of his estimated $21-billion – but likes to point out that he’s gone a step further than they have by giving away all his money. However, he admits he wasn’t ready to go back to the hard life he lived as a young man. “I’m not poor, not yet. I still have a credit card – an American credit card – and I take a VIP room in this hotel. And I take business-class flights. I allow myself this,” he says, smiling. As Mr. Yu speaks, his grandson, Dennis Pang, watches with obvious respect and affection. As someone who was in line to inherit some of the fortune, Mr. Pang admits that he was initially bewildered by his grandfather’s insistence on giving away what he had earned. But then he took a job as his grandfather’s personal assistant, and saw first-hand the good the Yu Pengnian Foundation was doing. “Before I came here, I was a little confused. But now when I see the people that he helps, I understand that it’s special,” Mr. Pang said. My. Yu’s two sons, both in their 60s, sit on the foundation’s board of directors.